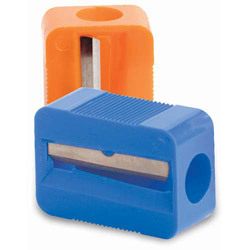 One-hole sharpener is designed for sharpening standard-size pencils. Design features a plastic casing and steel blade. Sharpener meets or exceeds standard for RoHS compliance for lead, mercury, bromine, chrome and cadmium. Assorted Pencil Sharpeners from Baumgarten's! 3336 In Stock today.